PLEASE NOTE: Unless you are a previous customer I only mend Wurlitzer and Rock-Ola jukeboxes. Sheffield. Rotherham. Barnsley. Doncaster. Worksop. Mansfield. Chesterfield. Matlock. Huddersfield. Wakefield. Dewsbury. Leeds. Halifax. Yorkshire etc. Specialising in Wurlitzer and Rock-Ola Jukebox repairs, restoration and servicing. In the Sheffield area and beyond. 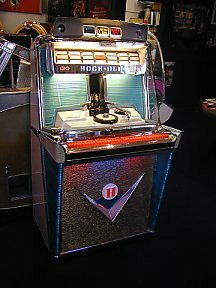 JUKEBOX REPAIR: I supply a call-out jukebox repair service for the Sheffield and outlying areas, specialising in early Wurlitzer and Rock-Ola machines. 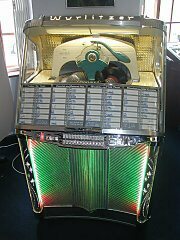 I also do repairs (broken bubble tubes, replacing plastics etc) on the Wurlitzer "One More Time" CD and vinyl jukeboxes. 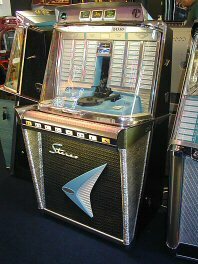 In some cases it is not possible to fix the jukebox on location, so it can be taken to the workshop for further work. Transport can be arranged for pick-up and drop-off of your jukebox as part of the fee, or if you wish you can bring the jukebox into my Sheffield workshop by your own means. JUKEBOX SERVICING: Older jukeboxes often become unreliable because it is many years since they were properly serviced (and especially if they have been stored in a garage). Even if a fault is fixed on site, it may only be a temporary measure so if you think there is more than one thing wrong with your jukebox it may need a proper service. 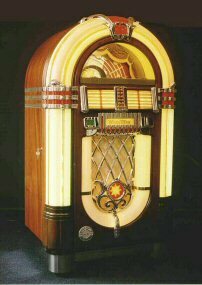 In these cases the jukebox is brought to the workshop where it is fully repaired and thoroughly tested. JUKEBOX RESTORATION: A full jukebox restoration service is available to bring your jukebox back to its former glory (and value!). 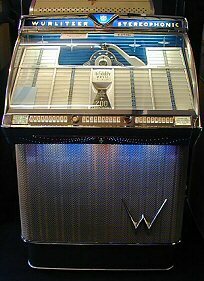 I specialise in Silverage Wurlitzer and Rock-Ola jukeboxes and have restored all the leading 'collectables' including W1100, W1700, W1800, W1900, W2104, W2000, Tempo I, Tempo II, R1448, R1455 etc. JUKEBOXES BOUGHT AND SOLD: I also buy and sell jukeboxes. Have a look at the "Jukebox For Sale" page by clicking the link below. If you are interested in any of these services just email using the link below or give me a call. If you would like to swap links, or want other useful information on repairs in your area, spares, manuals, jukebox hire etc then click the link below.